The day before this season, Tokyo was visited by heaviest snowfall in twenty years. There were delays and cancellations of transportation facilities to / from Tokyo effecting many to their destinations. We had a election of the governor of Tokyo today which may have effected the voting rate because of the snow but unlike yesterday, we had a brilliant sunny weather, melting the snow left. It is hard to believe that we are actually in spring now from the ‘Koyomi‘ with heavy snow like yesterday. Still, if we believe the idiom of ‘San-kan shi-on’, we should be facing the warmer spring soon. So, the season we are facing from to today is Jikou of Risshun. 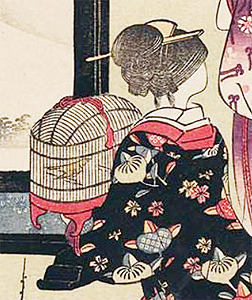 The phrase of this season is simple, ‘Uguisu naku’, meaning uguisu, the Japanese nightingale ‘naku’, the verb, sings. Uguisu, the Japanese nightingaleW, is a bird which calls beautifully among Japanese wild birds. 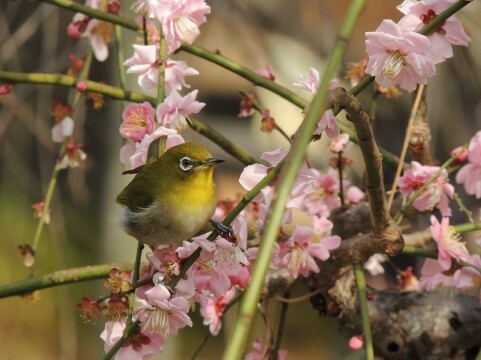 It has been called a bird that tells us the arrival of the spring by its beautiful call, ‘Haru-tsuge dori’. It is the male bird which sings in typical Uguisu call of “ho-hoke kyo” which can be heard among mountains, coming down to villages with even better songs after their repeated exercise to charm their partners. Uguisu, a Japanese nightingale. Photo from ‘Mori-no tousan kachousuketsu‘. 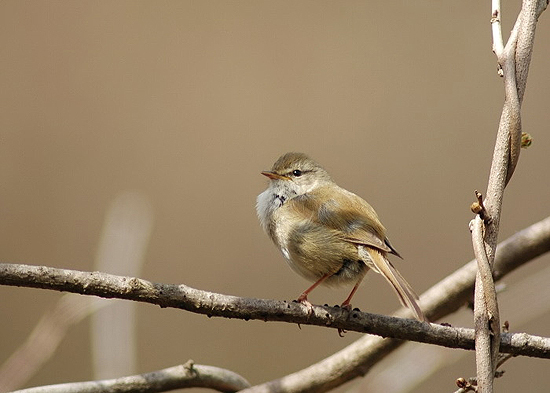 Uguisu is a tiny bird about 15cm in length which colour is ‘Uguisu-iro’, meaning the colour of Uguisu, olive brown. It is hard to see them even though you can hear their beautiful calls as they are very cautious. Because of their beautiful songs, they were kept as pets from ancient times in Courts and the nobles’ house, became extremely popular in 1800s, Edo periodW. ShogunW loved keeping them too. A room of high courtesan. You can see a girl who is holding the cage with Uguisu. 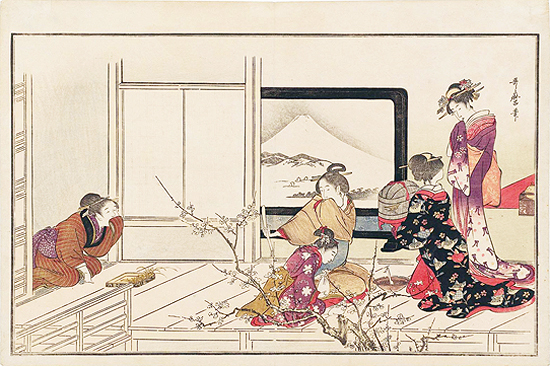 Picture by Utamaro Kitagawa. Competitive shows were held to decide the best Uguisu in Edo, or even between the large cities. You can see how people were obsessed in keeping Uguisu at their home in some of the ukiyoeW by famous ukiyoe artists. Not only in drawings, Uguisu appears also as a motif of spring in many Japanese literature and poetry. There is a wild bird protection law in Japan now that it is prohibited to catch or keep Uguisu as pets or other use. ‘Ume-ni uguisu’, Uguisu in plum tree, a card from ‘Hanafuda’, a Japanese playing card. Mejiro, the Japanese white-eye. Also a cute bird in spring! The best scenery of Uguisu is thought to be with the plum blossoms which could be seen in one of the cards in Japanese playing cards, HanafudaW. Because of this stereotype scene of spring Uguisu, they are mistaken very much with Mejiro, the Japanese White-eyeW. The two type of birds gather on plum trees, Uguisu feeding themselves with caterpillars and Mejiro with flower nectar of the plum trees. You can tell the difference between the two by the white ring around the eyes of Mejiro which Uguisu doesn’t have. Uguisu mochi is a Japanese traditional sweet made from ‘gyuhiW ‘, kneaded rice flour with sugar or starch syrup, kneaded until it becomes a translucent paste, and the ‘an’, sweet bean pasteW. 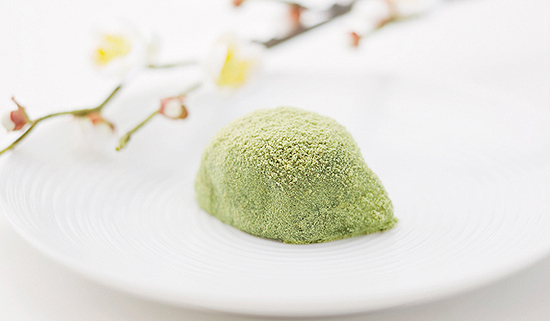 This Japanese sweet of the season is only available at this time of the year, ‘an’ wrapped by ‘gyuhi’ shaped and coloured with green kinakoW, roasted bean flour, like tiny Uguisu, the arrival of spring. Uguisu mochi. A seasonal Japanese sweet in colour and shape of cute Uguisu. Photo from Kagurazaka Isuzu Official Site. Even if you don’t like Japanese sweets, it is interesting to go and see the Japanese sweet shops to see what is thought to be seasonal at that time in Japan. You will be able to see some sweets related to plum at this time of the season apart from this cute Uguisu mochi now at the Japanese confectionary shop. ‘Uguisu-no kona’, discontinued Uguisu no fun cleanser that was a long seller for more than 60 years…. Photo from Biyobunkasha Official Site. ‘Uguisu no funW’, the feces of Uguisu, has been one of the Japanese face cleanser used by women from Heian periodW until now to thoroughly remove makeup ,whiten and balance the skin tone. Buddhist monks also used this cleanser to polish and clean their bald heads. It may sound strange to those who have never heard of such item as facial cleanser but it is said that because Uguisu has short intestine, the droppings have protein, a fat-degrading enzyme and whitening enzyme left which acts on fat and scurf to whiten and avoid spots. 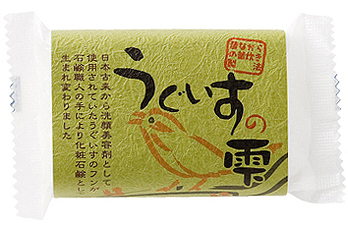 It is still sold among other cosmetic cleansers as cleansing powder and soap that contains the droppings but as Uguisu is protected under the law and is prohibited to culture, the ingredients of the cleansers which are sold now as Uguisu no fun no longer is made from Uguisu but similar bird that has same dropping contents. Still, the oldest company which has been selling Uguisu no fun for over 60 years had to end the manufacturing of their Uguisu no fun from lack of fine ingredients. We have never used Uguisu no fun but as far as what we hear from Uguisu no fun users, most of them have been using it for more than 10 years and that they say it is the best cleanser they have ever had. The only Uguisu no fun cleanser which you can still buy in Japan quite easily is the soap below by Shakariki Ltd. called ‘Uguisu no shizuku’ which could be a good souvenir! ‘Uguisu no shizuku’, a soap that contains Uguisu no fun still avaliable. Photo from ‘Sekken Hyakka‘ by Kagakusha.Co.,Ltd.